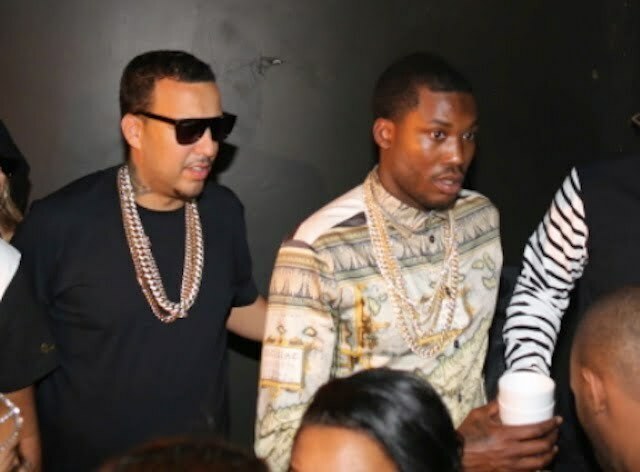 French Montana has stepped forward to quell rumors of an alleged fight with Meek Mill and his Dreamchasers backstage the Philly Powerhouse concert. Who knew that French Montana and Meek Mill had beef. Montana was one of the headlining acts on the show, as well as, Meek Mill who put on a show for his home crowd. Sources say the Philly rapper’s crew confronted the “Unforgettable” rapper because he names dropped Meek in a song and did some other unnamed things that upset Nicki Minaj’s ex-boyfriend. So because of that the Dreamchsers allegedly put the paws on him. It didn’t take long for French Montana to take a jab at the allegations. He posted a video on social media showing off his scratch free face and unsoiled sneaker, as well as, his diamond chain and bracelet. He also made a point to show that he was eating some good Philly cheese steak and drinking Ciroc. Usually, in these fights, someone always takes someone elses chain just to prove a point. But none of that happened this time around and according to French the rumored fight never happened. Nevertheless, someone from Meek Mill’s crew posted on IG that something did go down. Last year, French Montana commented on the beef between Drake and Meek Mill during an interview with Larry King. “I feel like it’s just a sport. It’s a sport, so it’s like competition,” Montana said. “Sometimes you spar with somebody. That’s what that is. Cause ain’t nobody get hurt. Nothing happens. So, I feel like it’s just part of the game. It brings excitement to the game.” Meek wasn’t too happy about his statement and took a subtle jab at him on Instagram. Watch the video clip below to see what French Montana and his crew are saying about the alleged fight.